When Geoff Thompson asked me to join his EuroSTAR 2011 Program Team I did not hesitate to say “Yes“. If only I had known how much work it was going to be I might have reconsidered. It did however give me one of my best Tweets ever at a testing conference, “Oh no! The smoke machine has failed.” Was it fun? Probably . . . . This is the grand opening. 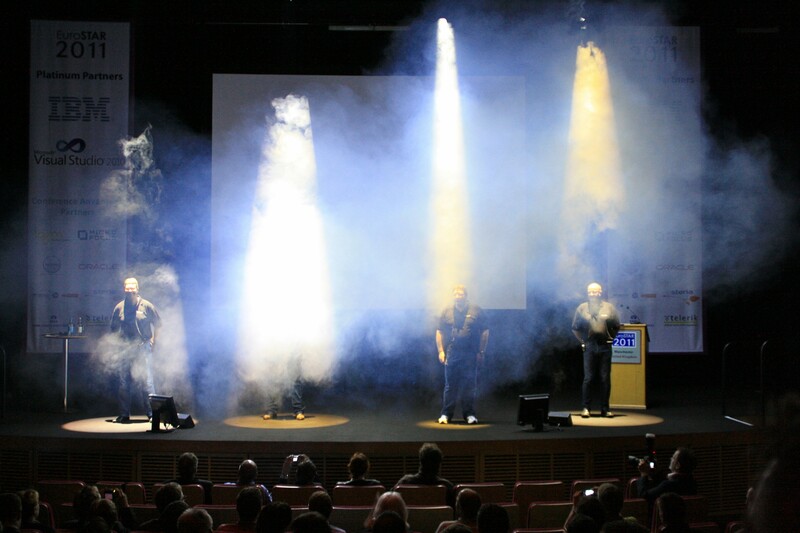 As you can see, the conference chair, Geoff, was totally engulfed in smoke. To set the scene: The auditorium lights were turned down. The smoke machine was turned on. All that the audience could hear was a hissing as smoke filled the stage. Then Thin Lizzy started up. 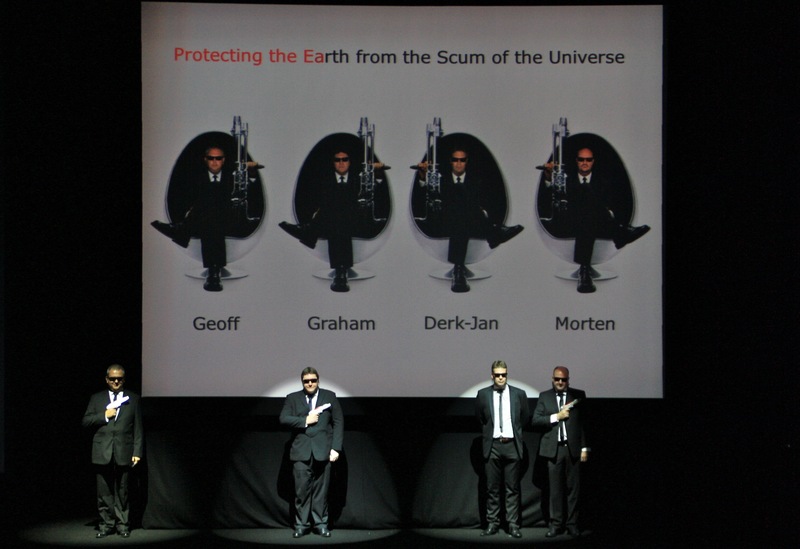 As the band hit “The Boys are Back In Town” the 4 members of the team, Geoff, Derk-Jan, Morten and I, had walked from behind the screen, out of the darkness to the front of the stage, and were illuminated by four very bright spotlights. It’s one way to start a testing conference. Throughout the week the day was started with a Hello Manchester session, which included all sorts of amusements and insights form the program team, et al. The closing session was also fun, organised by Morten, and included a raffle for a place at the following years conference which involved little bugs hidden in the backs of the seats. EuroSTAR 2011, Manchester, Nov 2011. This entry was posted in Keynote, Presentations, Testing and tagged #esconfs on 21st December 2014 by admin.